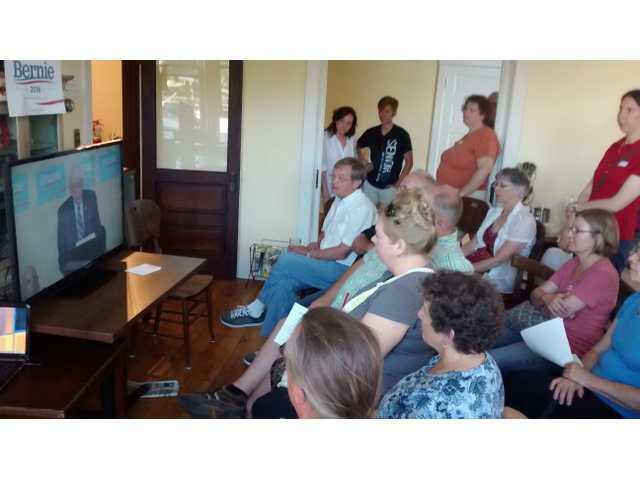 The first Sanders for President meeting was held July 26. POSTED August 26, 2015 11:00 a.m.
A local group is working for the election of U.S. Sen. Bernie Sanders of Vermont for president. The first meeting was held with 26 people at Driftless Market July 29. The Platteville group was one of 3,500 groups totaling more than 100,000 people meeting on the same evening all around the U.S. to promote Sanders’ campaign. “It looks like an important political and social ‘revolution’ is taking place as people organize for Bernie all around the country,” said John Webster of Platteville. Sanders, an independent and self-described socialist running for the Democratic presidential nomination, spoke on a livestream from Washington on his major campaign themes such as addressing income inequality, raising the minimum wage, reforming campaign finance, overturning the U.S. Supreme Court Citizens United decision, providing universal health care for all, providing free public college education for all students, taking action om climate change and protecting Social Security and pensions for retirees. Another meeting was scheduled for this week. For more information check Facebook/Platteville for Bernie/Events or contact Gaile Schwickrath, 348-2868.